The music was uplifting, and slightly mournful (which totally made me think of Simeon's prophecy to Our Lady.) The servers were great. Fr Z was present in choir - I suspect jet-lag was catching up with him, and he was due to say the evening Mass in the parish. Fr. Tim preached an excellent sermon on the meaning of "purification" and the comparison between Christ's silent and unnoticed arrival in the Temple with his silent and often unnoticed descent onto our altars during Mass. I came with my dinky phone camera all charged up and ready to take photos. Fr. Tim is obviously unimpressed with the quality usually obtained: he handed over his snazzy digital camera. I look forward to seeing what he makes of the shots I took. UPDATE: I see that Fr. Z has already posted on the events at Blackfen... and of course, he had his own camera. You can see an excellent shot of the Elevation here. Oh boy, tomorrow is going to be quite something! 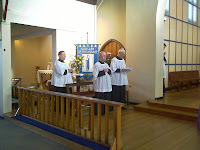 At Blackfen we have started to have a monthly Missa Cantata on Saturday mornings (the usual Saturday morning Mass is, dare I say it, "just" a Low Mass!) Tomorrow's scheduled Missa Cantata just happens to coincide with Candlemas... the Feast of the Presentation of Our Lord in the Temple (also previously known as the Purification of Our Lady.) This means a big procession (if the snow holds off) and candles. Fr. Z has popped over for a visit, and no doubt he will be making an appearance. I haven't quite worked out the Celebrant, Deacon and Sub-deacon bits, so I'm as yet unsure who does what and when... but I'm more than happy to learn! I'm particularly pleased that I'm able to hear Mass tomorrow, as Candlemas was the occasion on which my patron saint, St. Anne Line, was arrested. Someone noted the presence of lots of people at the house she kept for Fr. Gerard (they were gathering for this feast day) and reported them to the authorities. The priests were able to escape, but the presence of the vestments and sacred vessels and everything set up for Mass was enough to secure a conviction. This Sunday is also the feast of St. Blaise. The tradition of blessing throats on the feast of St. Blaise (using candles from Candlemas, I believe) is one to which I am very attached: trying to teach with laryngitis is no joke, so invoking the protection of St. Blaise makes good sense! "What a suffocating closed shop we have running the Church in England and Wales! Fr Finigan, parish priest of Blackfen, Kent, is a traditionalist pastor of great holiness and intellect; he also writes a fantastic blog. That a priest of his quality should not even be made an auxiliary bishop, while box-ticking middle-managers of very limited gifts receive a mitre, is a scandal." Given the hierarchy's attitude towards Mr. Thompson, I'd guess that Blackfen can rest easy: we're probably going to be able to hang on to our Parish Priest for a while longer! I was delighted to see that Fr. Tim's post on donating stuff to the Sisters of the Gospel of Life via Amazon and other internet sites which deliver their wares produced such a good result, even ending up on the front page of the Catholic Times! It's heartening to realise that blogging can be a real force for good, and not just a "talking shop" ! Ok, I don't actually have a therapist... just you lot out there who indulge and encourage me to pour out my heart and soul on the blog... therapy-on-the-cheap! Anyway, I have been awarded an "Excellent" award. A Thorn in the Pew and Mum6kids both nominated me, for which I thank them... oooh, I feel all warm and fuzzy! I think it's probably just another type of meme, only easier to complete. By accepting the award, you have to nominate at least 10 other blogs. No actual limit. And you don't have to be original either... so no crazy hunting for a blog that hasn't been awarded anything yet...! So, I would like to pass on the award to: Fr. Tim at the never-ending Hermeneutic; Fr. Ray in Brighton; Karen on the left coast; Newhousenewjob who's Just Doing Her Best; Fr. 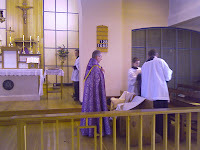 Z who will be in the vicinity of Blackfen very soon (and suffering our slow British blogging speeds); Fr. John (that Kentish cleric); Fr. Paul, who's no longer a "Lune-atic"; Leutgeb (so she doesn't have to blow her own trumpet... oops, sorry, French horn! ); Mark (Hello-ello-ello); the Roman Caveman (he just has to join this club... I always wanted to go clubbing with Cavey! ); Hilary, who's eating her Orwellian al-fresco meal; Jeff (jesting curtly); Paulinus who is conquering away and last-but-not-least Ttony, if he can find the award under all those muniments! He smiled in a very understanding way, and fixed the oil for me. I love being blonde! Ellis Peters' Brother Cadfael, Giovanni Guareschi's Don Camillo and Chesterton's Father Brown for a Murder Mystery Weekend. It would be fun to see who got the right answer quickest! Probably The Da Vinci Code by Dan Brown. The inaccuracies I've heard about would be so tedious I might even be tempted to gnaw open my radial arteries to speed up the process! Fiction: The Hunt for Red October by Tom Clancy. I love spy stuff, high-tech gadgetry and page-turning excitement. Non-Fiction: The Spirit of the Liturgy by the Holy Father in his previous existence as Cardinal Ratzinger... it explains why I get so worked up about liturgical abuses. I refuse to choose just one! The Sinner's Guide by Venerable Louis of Granada. Introduction to the Devout Life by St. Francis de Sales. True Devotion to Mary by St. Louis de Montfort. The Imitation of Christ by St Thomas á Kempis. I re-read these ones frequently anyway, though not every year. Ummmmmm... I've discovered that it's a bad idea for me to browse internet bookstores just after payday. Much better to wait until someone recommends a book, and buy that ONE. Of course, it's also far less fun to do it that way, so I rarely follow my own good advice. Big room. Lots of shelves, but nothing above head height, as I can't climb ladders or steps easily. Large french windows looking onto a lawn down to a river or lake. Lots of central heating. Squishy armchairs which can be curled up in. And lots of books. All the classics by the saints, and lots more books on the Church and her teachings by other good writers. Nothing heretical. And a small section of murder mysteries and spy thrillers for when I need to veg out. This is the last chance to make known your views on the Human Fertilisation and Embryology bill, which is currently scheduled for debate in the House of Lords on Monday 4 February. 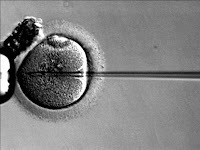 * permit the creation of human-animal hybrid embryos. Over recent weeks, the Government and supporters of embryo research have blocked all substantial efforts to lessen the evils of the Bill during its passage through the Lords. Although it is unlikely that pro-life Lords will defeat the Bill, a strong vote against it now will help and encourage MPs to oppose the Bill when it goes to the House of Commons - probably in mid-February. Many people wrote to the Lords in November asking them to oppose the bill at second reading - this had great impact and helped encourage pro-life peers in their opposition to the bill. It really is vital that as many people as possible write - you can write to any of the Lords on this matter. Even though the Bill is unlikely to be defeated, the important thing is that no-one can claim that they didn't receive any letters in opposition, or that no-one appears to have any real objections because they'd write if they did! Remember, one day you are going to have to stand before Jesus Christ, and when he asks what you did for even one of his "little ones" (remember that cup of water he mentioned?) you might want to have an alternative to "Umm, nothing much, actually! Sorry about that..."
Writing a letter isn't difficult. SPUC provide helpful hints. They also provide email addresses for most of the Peers, although they also state that written letters are more likely to have an effect. SPUC is the pro-life group with most experience of parliamentary matters, so I would recommend taking their advice.